On Saturday 22nd May, 35 OWs with wives, partners and other family members, arrived at School bright and early for lectures! After a welcome and a hot drink to start the day, they proceeded to the “Trenches Classroom”, no longer recognisable as the old squash court. The room has been decorated with WWI propaganda, information and numerous replica artefacts that immediately inspired interest. Those assembled were then treated to an hour-long presentation about 1st World War Aviation, by retired RAF pilot, Squadron Leader David Linney OW (1959-66). David joined the RAF in 1967, during which time he flew Harriers. Since retiring, he has flown Hunters, Canberras, Hawks and Falcons and displays his SE5A Replica with The Great War Display Team (www.greatwardisplayteam.com). David gave a fascinating insight into the life of WWI pilots, who were often young, under-trained, subject to extreme cold and terrifying circumstances. 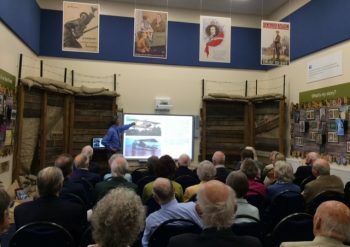 After the talk, the attendees went through to Whitgift’s “Remembering 1916” exhibition, described by The Sunday Telegraph as “a fascinating… extraordinary exhibition”. It did not disappoint. All were moved by the poignancy of the stories behind the displays and the museum-quality of the experience. A majority of the group then enjoyed lunch in the “Edwardian Café” before joining the “Open Gardens” event.